Watercolour of a river scene on the Ganges river at Buxar from 'Views by Seeta Ram from Patna to Benares Vol. II' produced for Lord Moira, afterwards the Marquess of Hastings, by Sita Ram between 1814-15. Marquess of Hastings, the Governor-General of Bengal and the Commander-in-Chief (r. 1813-23), was accompanied by artist Sita Ram (flourished c.1810-22) to illustrate his journey from Calcutta to Delhi between 1814-15. Buxar, a city in Bengal, was the site of the famous Battle of Buxar in 1764 when Nawab Shuja ud-Daula of Avadh (r.1753-1775) was defeated by Sir Hector Munro. 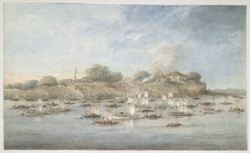 View of the flotilla on the river, with many pinnace budgerows (some with palanquins on their roofs), and beyond a small British station (Union flag) on the cliffs above; lots of people and smoke rising from a fire. The two largest boats were occupied respectively by Lord and Lady Hastings and their children. Inscribed below: 'The River Butar.- Ganges in the foreground with part of Lord Moira's Fleet.' This seems to be meant to be the River 'at' Buxar, which the flotilla reached on August 19th.